The people who work mainly with digital analytics in GDS have been called ‘Product analysts‘, but we have increasingly felt this does not adequately describe our role. The Service Manual calls our role Performance Analyst and Digital performance analyst. 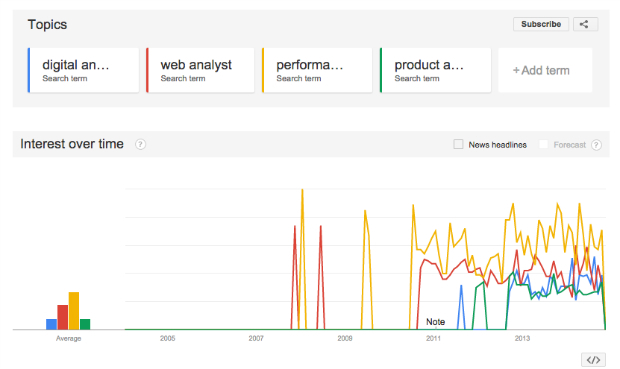 Other terms used are Digital Analyst and Data Analyst. It’s confusing. We are also recruiting soon and wanted a more meaningful title. 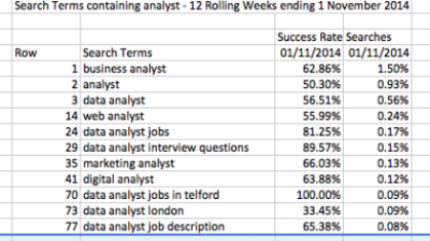 So it felt like time to revisit the title; and, being an analyst, I had a look at some data. 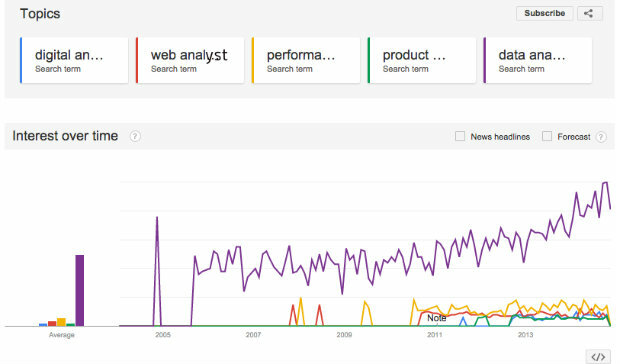 Performance analyst is strong, but data analyst is the most popular. But what is the job description behind the title? I reviewed a range of job descriptions for each job title. Some sample extracts are shown below. I found that there are no clear delineators. Many role functions and skill requirements overlap. So how do the titles and job descriptions map to what we do it GDS? Although we are expanding our skill set in this direction, the main ‘data science’ competences for a data analyst are outside of our core skills set. A recruitment campaign using this title risks putting off suitably skilled candidates who could grow into wider competences later. Emphasis on performance and KPIs. 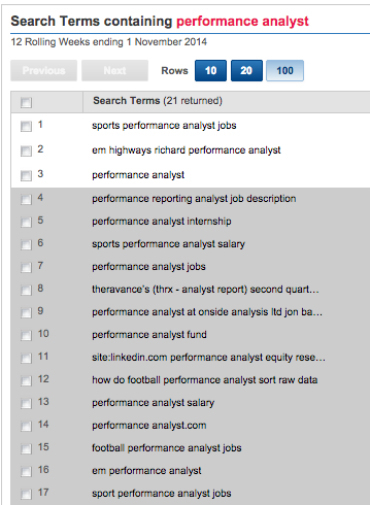 In a wider domain, the job title can be associated with sport science. A close association with products and with reporting. Close match, but tends to exclude our ambition to also work with non-digital datasets. Close match, but tends to exclude our ambition to also work with non-digital datasets. I would exclude as it is an out-of-date term. In the job market, many role functions and skill requirements overlap, but on balance, we decided to go with Performance analyst. In GDS, we focus on understanding user needs and measuring how well our content and services perform in meeting those needs. This title encompasses the scope of what data we work with and where industry trends are going. This brief research showed that the outside world used a variety of titles, but increasingly expect people to work with different data sets. Working within the Data Analysis & Provisioning pillar of the data management team, this role will be central to establishing a better understanding of its data estate, set out data acquisition approaches to address prioritised data requirements, to support Proposition teams to accelerate the data needed to move from idea to implementation, and to build up data management knowledge and best practices to enable the organisation to use data to drive key propositions. Promote continuous development of performance measures. Essentially, the role is to help the whole business understand how the product is performing, what our customers do with it, what our customers think about it and how we can make their lives better. This role is heavy on insight, it’s not just about reporting. You’ll focus on automating data processing, reporting and ensuring data from source-to-report is reliable, understandable and consumable. You’ll work closely with stakeholders to build new data sources, reports and analytic dashboards and be the first point of contact for questions about product data, company-wide. You’ll also utilise your supreme SQL and Excel skills to quickly bring insight to a wide variety of topics and communicate with people in all areas of the business. You’ll need to make technical decisions and work out how to automate so you can focus on the fun stuff and design reports and dashboards that will make people’s working lives a data-rich joy. Development of mobile performance measurement and a process for monitoring and reporting app performance. Undertake ad-hoc reporting and analytics based on business requirements and needs. Help to determine KPIs for all elements of the software experience, then build/automate reports to monitor them on an ongoing basis. Ensure our reporting is joined up with other parts of the organisation so we can report on the end-to-end customer journey. Work closely with the core analytics team to share best practice and insight. Lead, commission, undertake and deliver analytics, data and measurement projects across a range of digital media. Contribute to the development and delivery of digital media audience data, measurement and analytics strategy. Ensure the organisation has leading-edge analytics tools, measurement, metrics and skills; and employ those to help the business achieve its aims. Partner with teams across the organisation to demonstrably influence decision making, through robust data, analytics and insight. Partner with teams across the organisation to deliver technical projects on time, to scope and within budget. Enable and deliver best practice in digital media measurement and analytics. Leading the efforts on measurement of new projects and platforms. Deliver inspiring and actionable insights (rooted in robust data, analysis and measurement). Be recognised as an expert in digital media analytics, data, measurement metrics and industry standards. Deliver data, measurement and analytics which demonstrably help the business achieve its goals. Ensure that data, measurement, metrics and analysis are robust and in line with business requirements. Maintain high standards of presentation, including the development of new or imaginative ways of using or communicating data and insights.